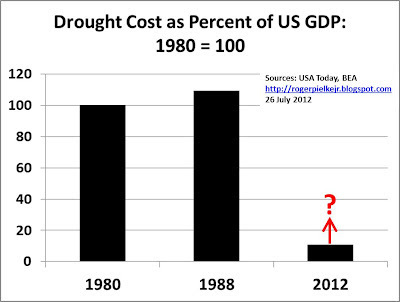 USA Today reports some estimates of the costs of the current US drought in comparison to the 1980 and 1988 droughts. The enormous drought scorching the central USA will almost certainly cost at least $12 billion, making it the costliest since 1988, experts said Wednesday. 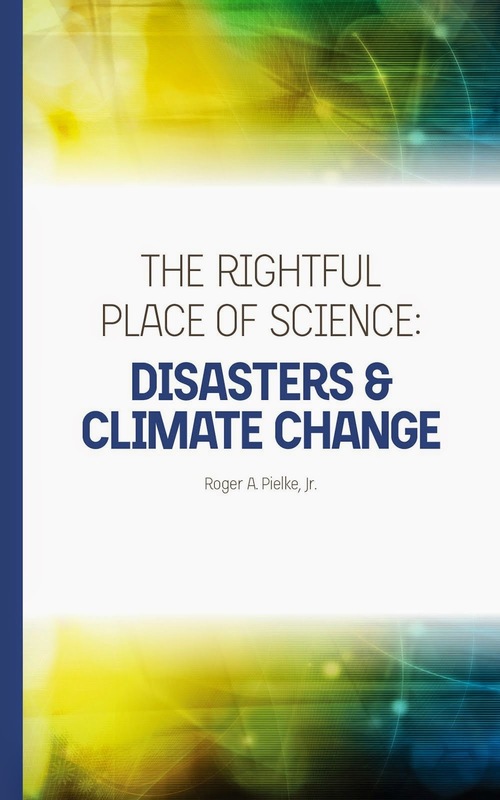 "There does seem to be near-unanimous agreement from industry experts that this year's drought losses will surpass the $12 billion recorded in 2011," says meteorologist Steve Bowen of Aon Benfield, a global reinsurance firm. . .
About 64% of the contiguous USA is in a drought, according to today's U.S. Drought Monitor, a federal website. "Right now, it is difficult to say whether we end up reaching the loss levels of 1988 ($40 billion) and 1980 ($20 billion), given that it will be several months for agricultural industries to fully assess the total extent of their losses," Bowen says. As readers here well know, comparing aggregate loss numbers over time requires understanding that context changes. It is not enough to simply adjust for inflation. The graph at the top of this post shows the 1980, 1988 and 2012 (to date) estimates for drought damages, scaled to GDP (data from BEA), with 1980 scaled to 100. The graph shows that the 1988 drought was about 10% more costly than the 1980 drought, using the estimates reported by USA Today (which apparently derive from NCDC), even though it cost twice as much in current dollars. At $12 billion the 2012 drought would be about 10% of the cost of the 1980 drought and less than that when compared to 1988. The costs of the 2012 drought are sure to rise in coming weeks and months, but they have a long way to go to exceed the standards set in 1980 and 1988. So if you think 2012 is bad, you should know that it could be much, much worse.